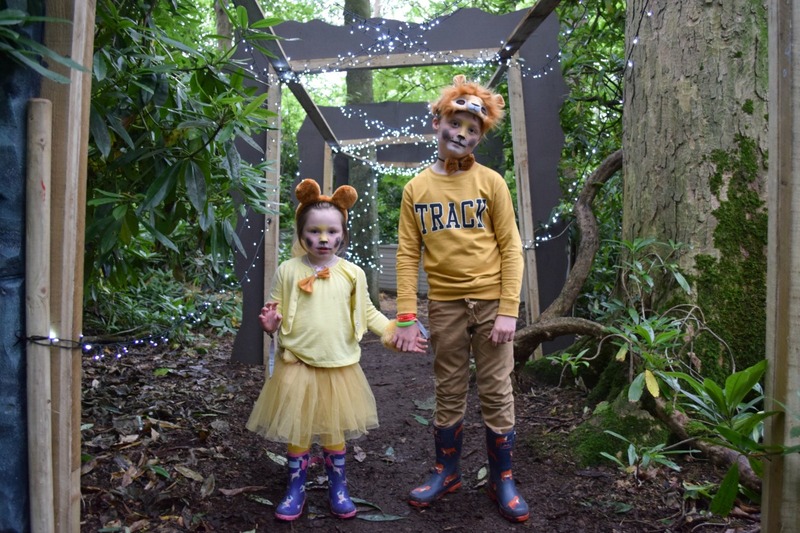 A spellbound forest, a midnight feast, lantern making, a fairy queen, twinkly lights and lots and lots of glitter – Just So was our first weekend family festival and it was absolutely magical. 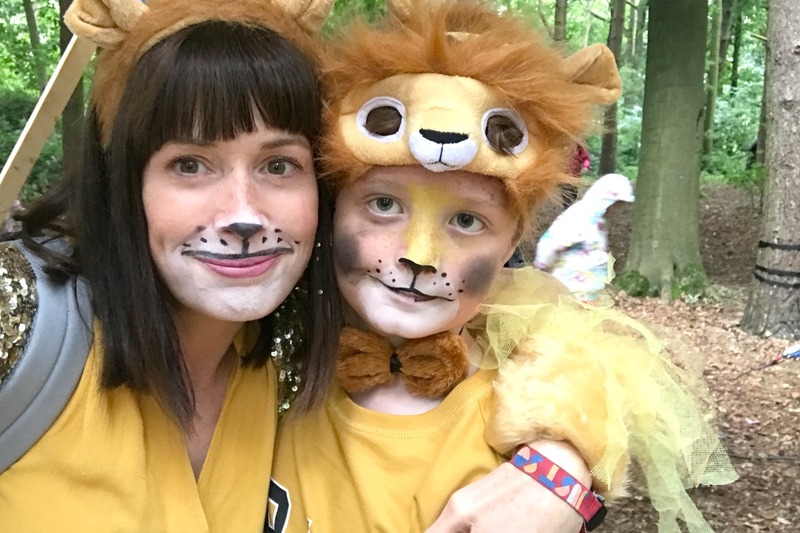 I could tell you about my favourite bits – hanging out with friends, introducing my little ones to a holiday under canvas, the dressing up and escapism – but it’d be better to start with what my kids liked best. 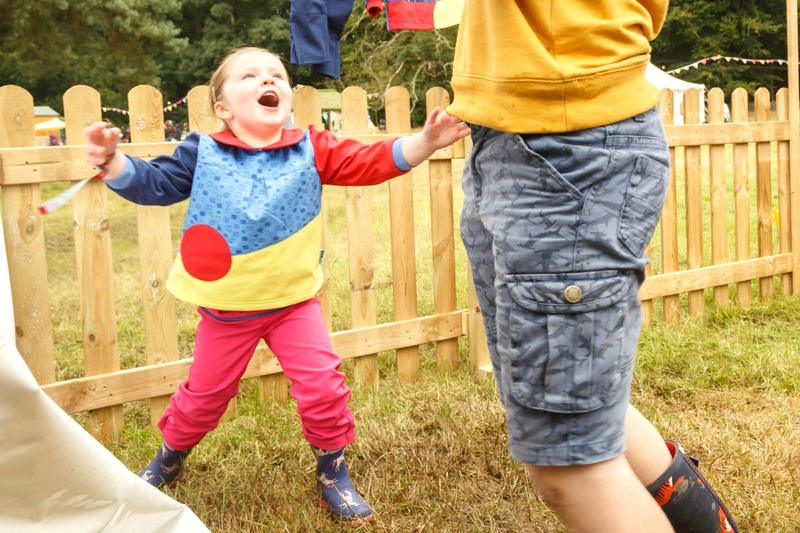 That’s because this festival – at Rode Hall in Cheshire – is geared absolutely around little minds and what makes them happy. 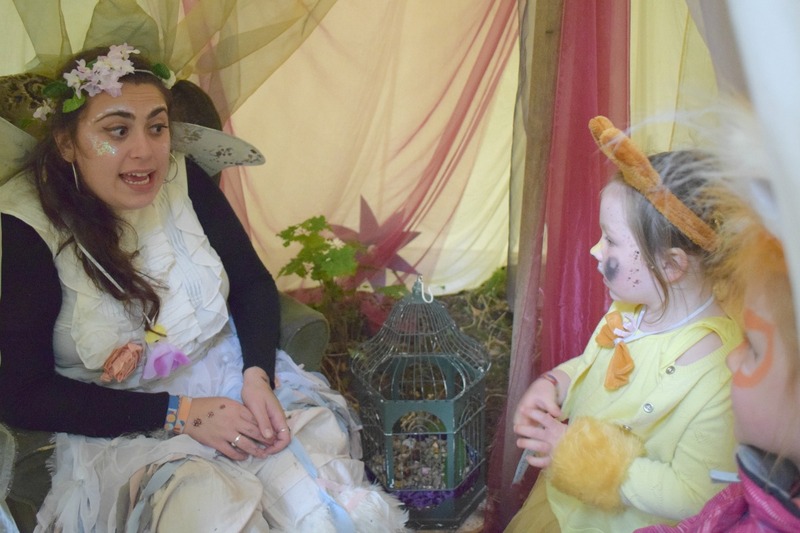 The Just So festival is all about creativity; everywhere you look there are people dressed as animals (in keeping with the festival theme), pop up shows in the fields, lights hanging from the trees, arts and crafts to get involved with, music, theatre, comedy and film. 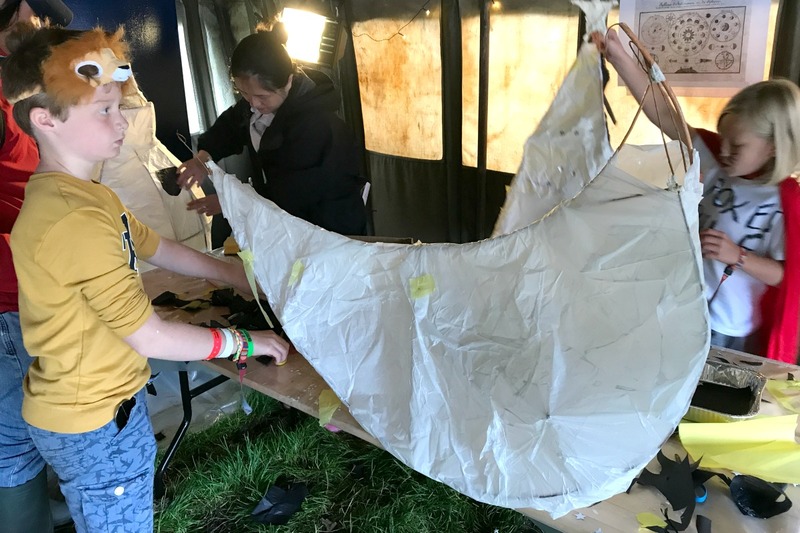 Sam, who is eight, loved making our own paper lanterns for an evening lantern parade; he loved the dressing up, the making friends, the human arcade games (want to dress up as Pac Man and be chased by a ghost in a maze? This is your place!) and the midnight feast. 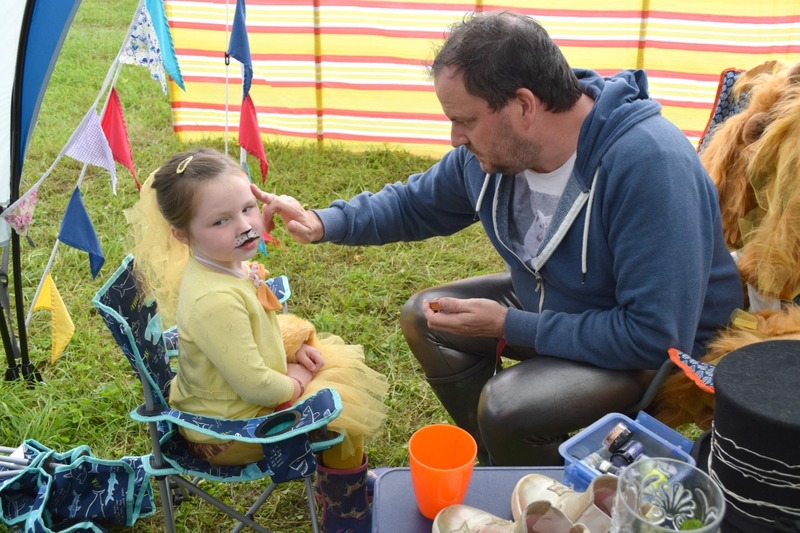 Flo, four, loved meeting the fairy queen, having her face painted with glitter, hanging out with Bertie from The Twinkle Diaries (a match made in blogging heaven no?) and toasting marshmallows by the camp fire. We all loved the food, the midnight feast – which was more of a sing song and show in a barn – and the freedom! Around the site, artists mingle with the crowds, which when I say crowds although there were more than 6,000 people there it never really felt crowded at all. 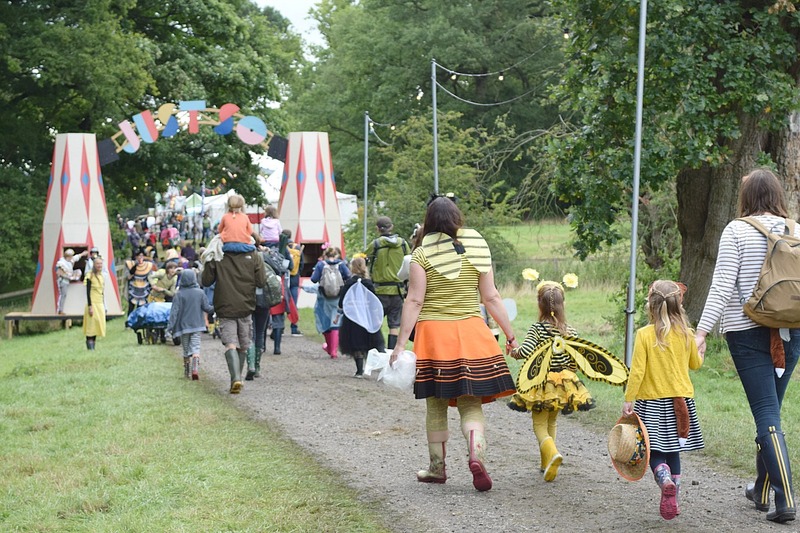 As someone who has never taken their children to a festival before, I can honestly say it was such a friendly, safe, fun and chilled out place to be we never really wanted to leave. 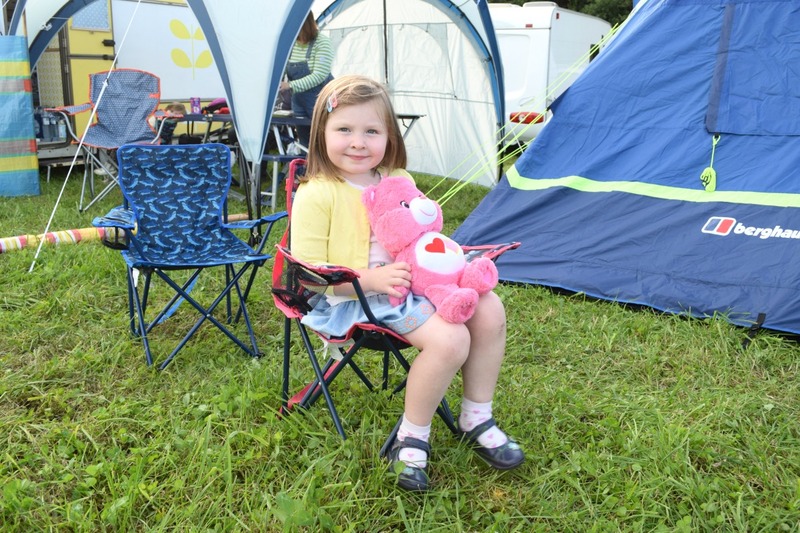 We had packed our tent, wellies and fancy dress and driven down the M6 to Just So to arrive on the friday afternoon. 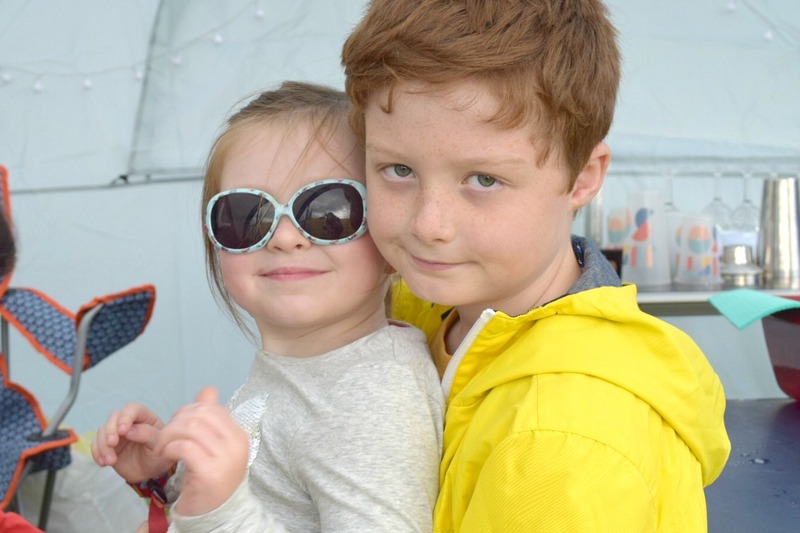 It was our first time camping as a family – something my son declared on night one as ‘the least luxurious thing we’ve ever done for your blog’ – but the English weather came through and saved us from a soggy weekend under canvas. 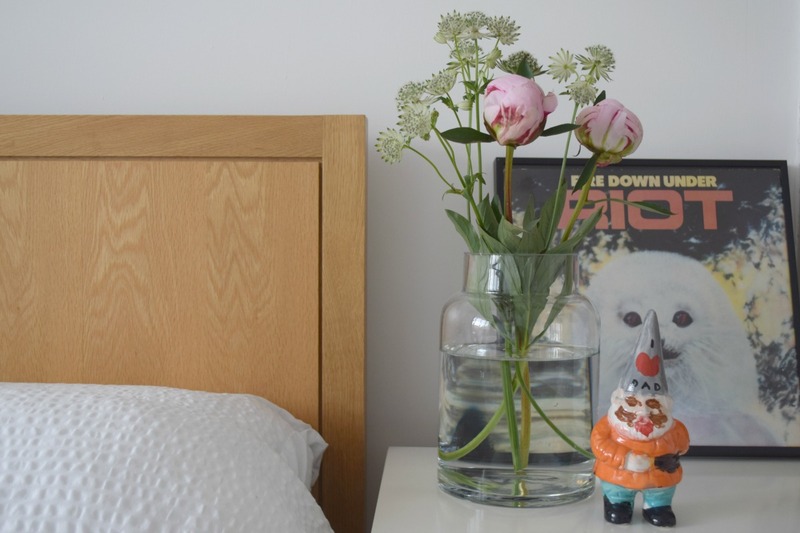 We loved our three nights in a tent, deflating airbeds and 1970s sleeping bags and all. 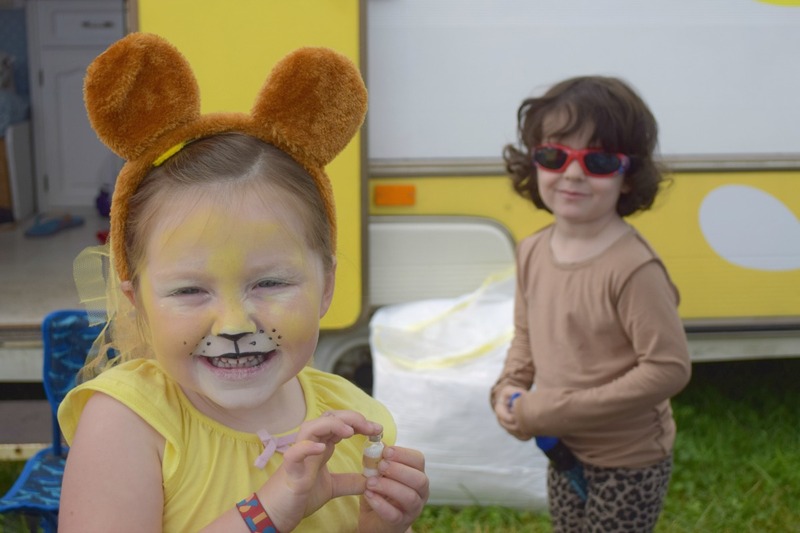 Setting up camp next to my blogging buddy Caro from The Twinkle Diaries and her family was a massive bonus; they are experienced festival-goers and campers in their vintage yellow caravan ‘Dolly’ complete with its mobile bar, cocktail shaker and pots of glitter. I really love hanging out with Caro and couldn’t have asked for a better campsite mate. Meeting her husband Dickie and four-year-old twin boys Bertie and Cosmo was lovely, as I have spent so long reading about them on her blog it was almost like we knew each other already! 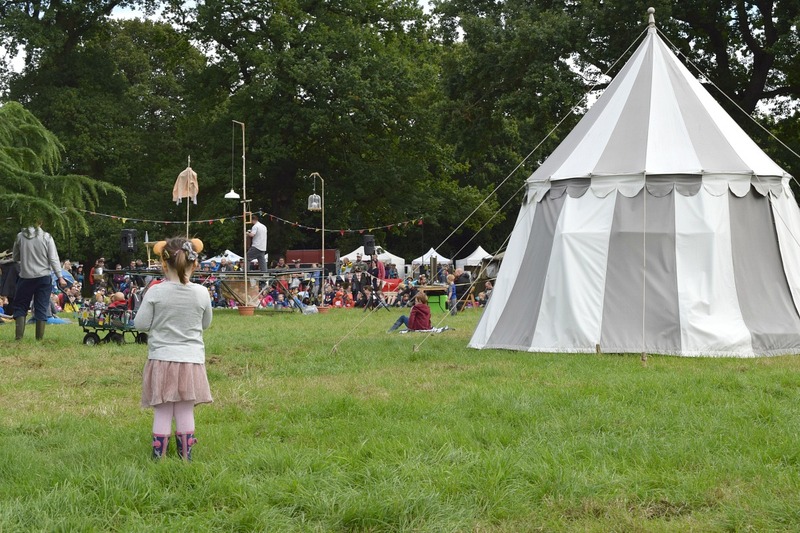 Once we’d put the tent up – which was easier than I expected – and set up camp, we wandered into the festival to explore. The camping area is really near the entrance so it just took a couple of minutes to walk up and into the main gate. Almost everyone we passed was in fancy dress, having chosen one of the ‘tribes’ set by Just So for the weekend. 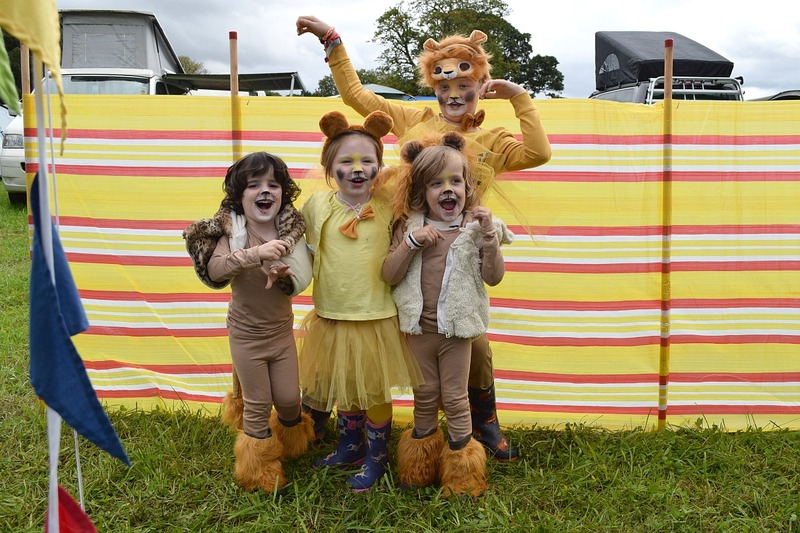 The weekend is based around which animal tribe wins the most golden pebbles, which can be given out for anything from cool fancy dress to good joke telling or getting involved in activities. I was given one for giving an impressive lion roar when asked by a passer-by, and my friend Rachel’s son (from The Ordinary Lovely) was handed one for falling over in the mud! Rachel and her family stayed in the boutique camping area, in a yurt I think, so keep your eyes on her blog for how she found that. There is bound to be a wealth of beautiful photos and an honest view of the camping experience. The tribes were announced well before the start of the festival and we were encouraged to pick a favourite and dress accordingly. 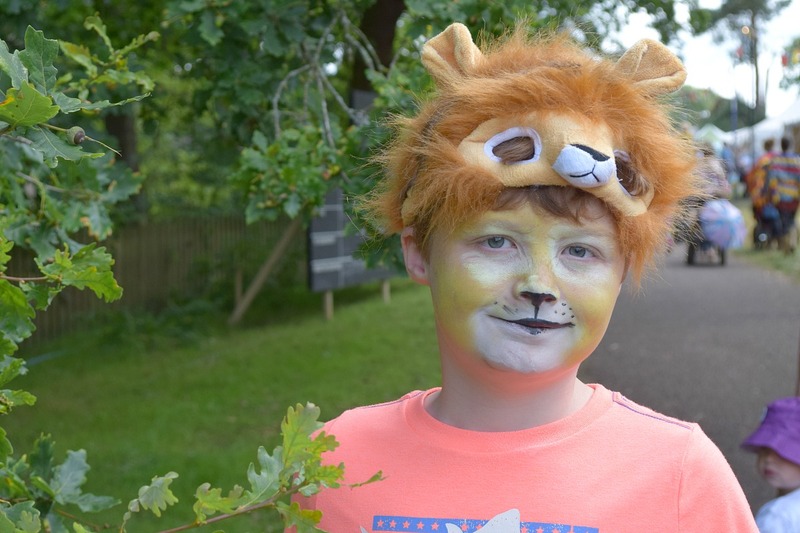 This year there were stags, frogs, bees, lions, fish, owls and foxes. 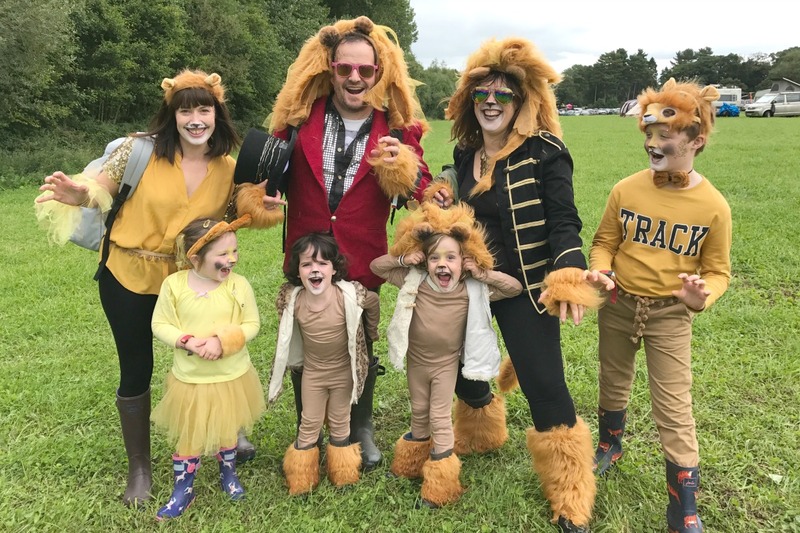 We had chosen to be lions, and had come prepared with netting manes, fluffy tails, masks, furry wristbands and lots of sparkly sequins. Because lions are known for adding sequins, don’t you know. 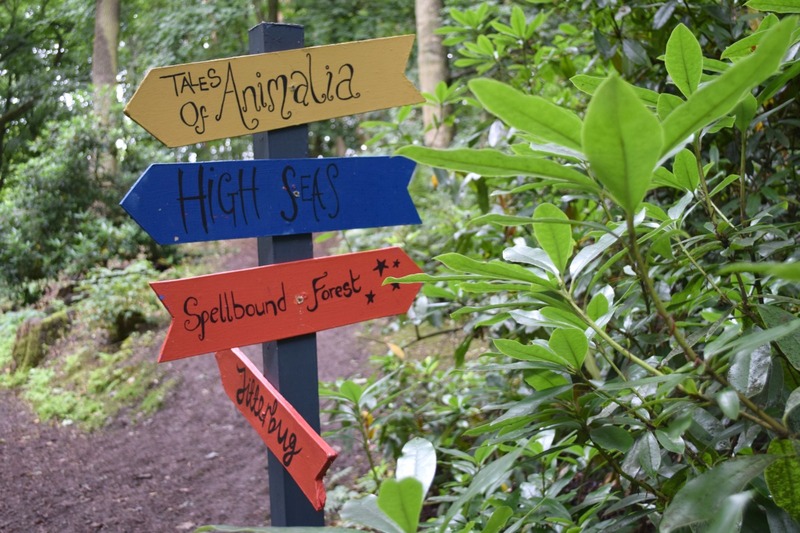 As we walked in, the Spellbound Forest was on our left and it was my favourite part of the festival by a mile. There was a campfire area inside, with flowers and fairy lights decorating it all around, logs to sit on and a mobile bar to one side. By day it was an arena for storytelling, shows and theatre. By night it came alive with music, dancing and marshmallow toasting, such a glorious place to walk through at night and so magical for the kids. Flo loved stumbling on a tiered birthday cake, watching children and adults dance and lights glowing all around. 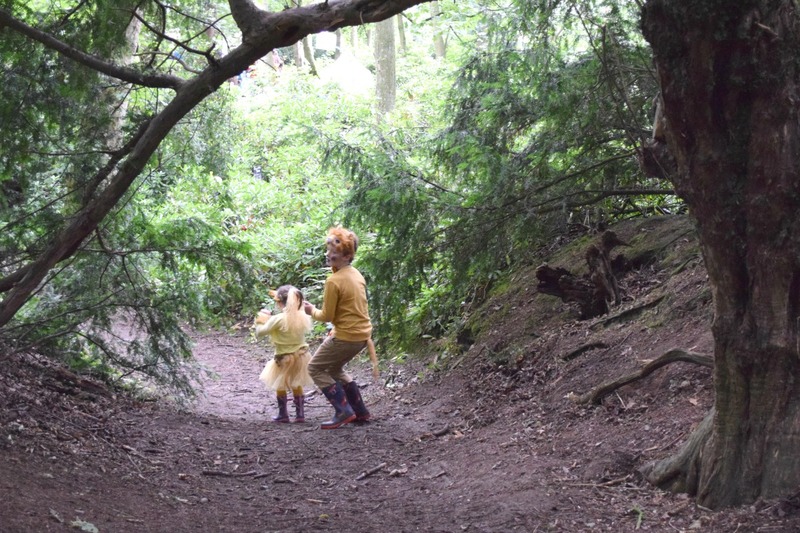 Through the woods there was Away With the Fairies, where we made our own fairy and elf necklaces, met the fairy queen in her tent, and hung messages and wishes on the trees. 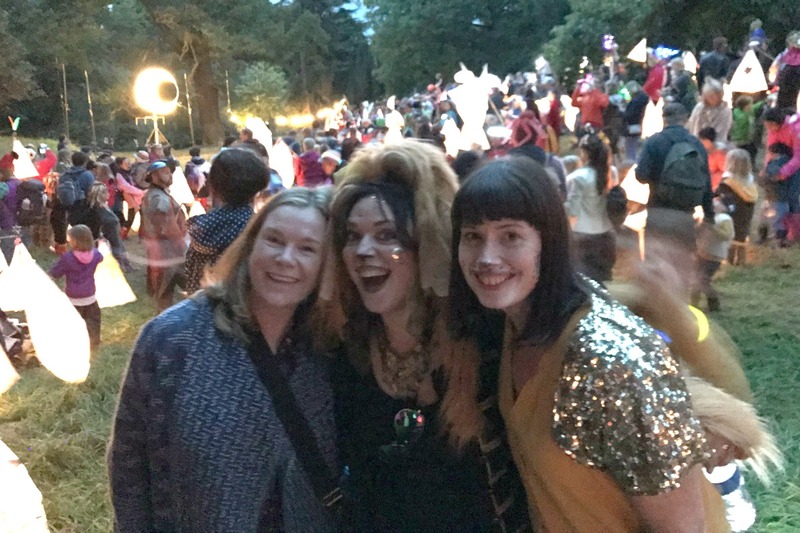 We all loved the fairy queen, we went to see her twice in three days and she listened to our wishes and nearly made me cry! She asked me for my wish and Flo said “Do you wish daddy were still alive?”, making for an interesting and emotional fairy conversation! Across the field in the star and space-themed Observatory we spent a few hours making our paper lanterns on Saturday morning. This was one of the things we all knew we wanted to do at Just So, so made a bee line for it first thing. 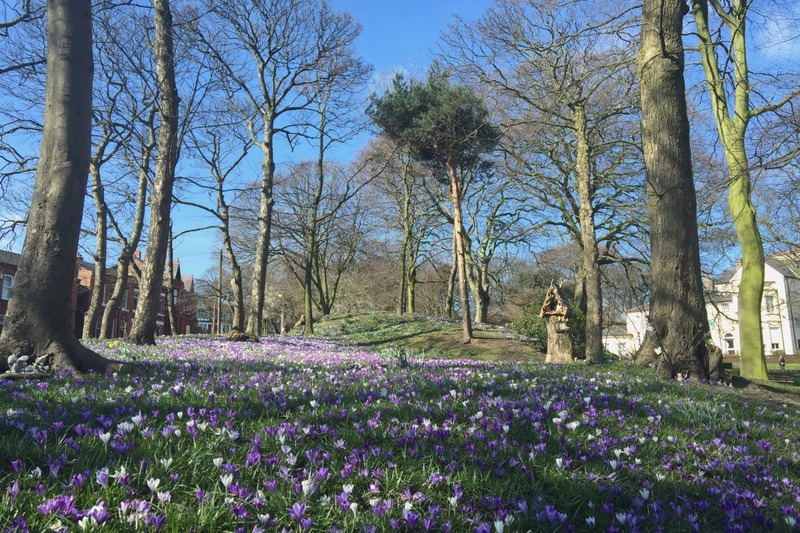 I’d been told the best approach was to look through the programme and pick out a few must-see or must-do activities, and for the rest of the time just go with the flo. Sam is such a crafter that I knew he would love the lanterns and he got stuck in without wanting – or needing any help at all. 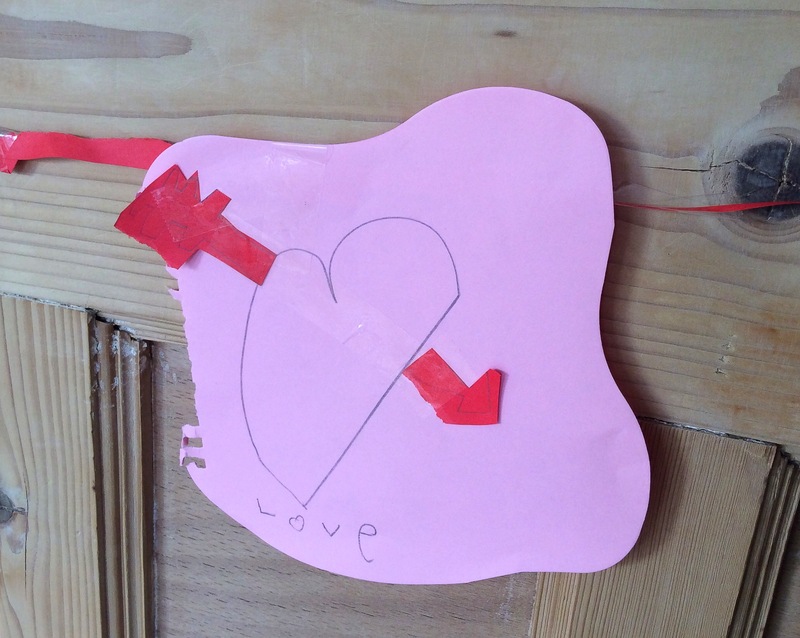 Flo and I worked together – well I mean she kind of helped me make one for her – bending and sticking willow together before covering it in two layers of glue-soaked tissue paper. 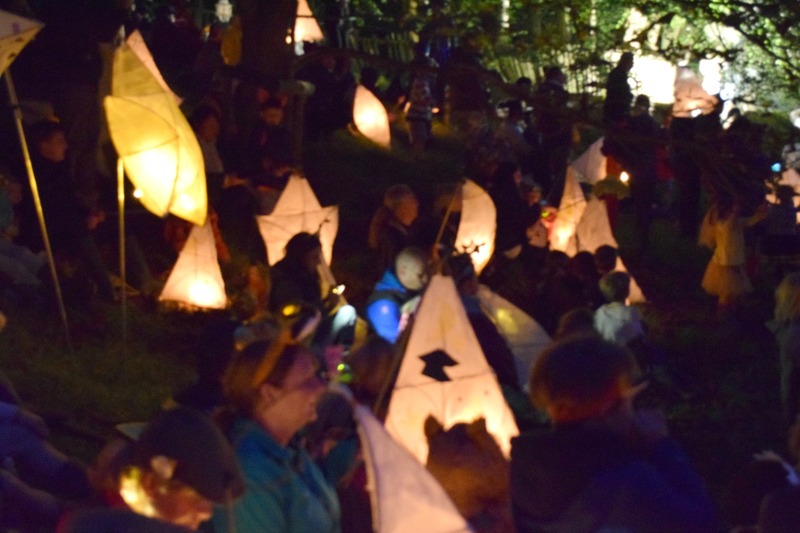 The lanterns, which each had a candle fixed inside, looked so effective when they were done and we left them in one of the tents to collect later on for the lantern parade. This parade was absolutely magical, a total highlight for me and I think most people who were there. Apart from a bit of a long wait for the parade to start (about an hour waiting with our lanterns I think), and a few hairy moments where I lost each of my kids, one for 20 minutes (yeah, what is the problem mum?! ), once we got started it was superb. Everyone could join in, if you didn’t have a latern you could bring a torch and join in the short walk to a field as darkness fell. When we all congregated with our lights it just looked so lovely, and it ended with a spectacle of shooting white fireworks and music, such a feelgood experience that had us all feeling like we were in our own happy festival bubble. Although Just So is for kids of all ages, the fun doesn’t stop at 8pm. 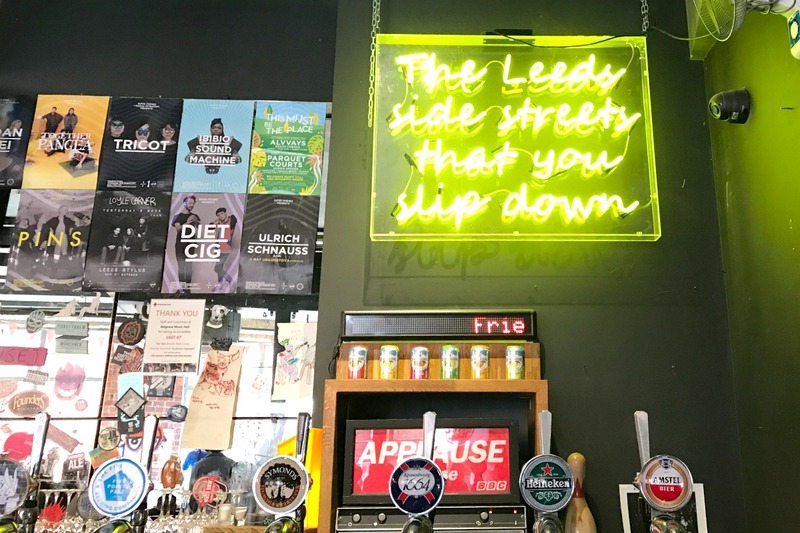 Quite the opposite, there are things going on all evening if you want to find them, from dancing in the Jitterbug Tent to black and white movies down at the Silver Screen, by night this place has so many more fun things to discover. 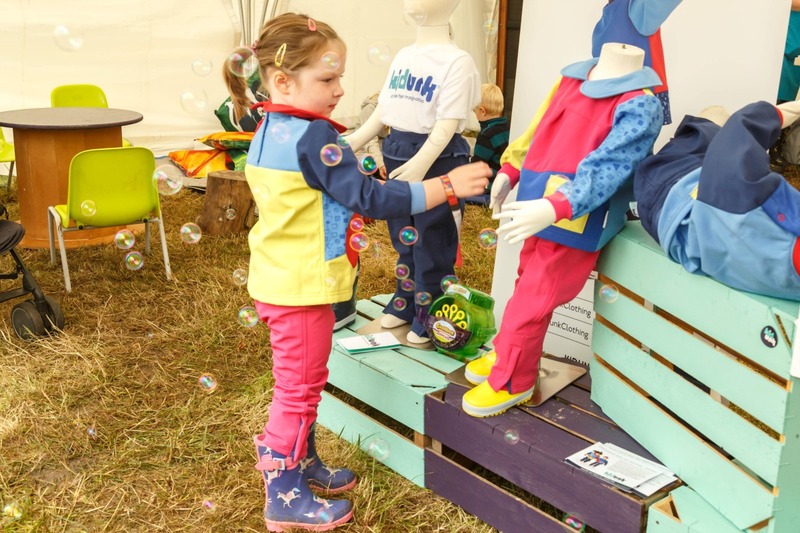 We also spent some time testing out a new water repellant playsuit from new brand Kidunk, which launched at the festival. 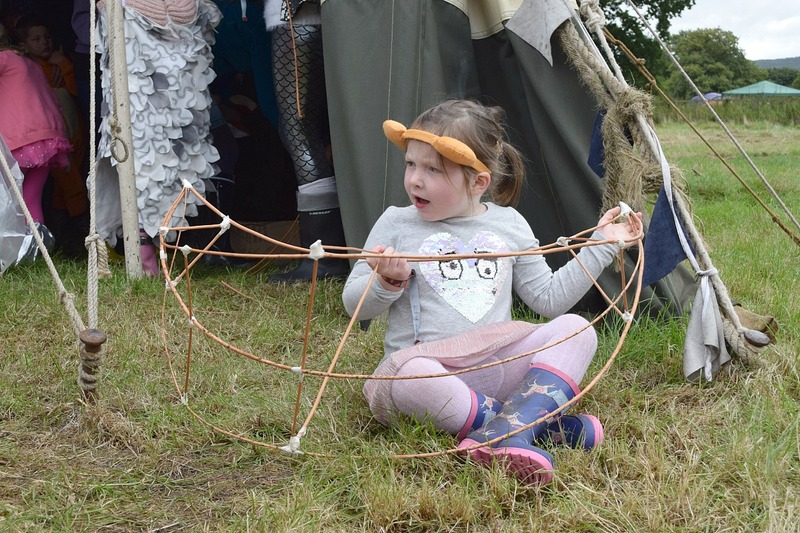 Kidunk had a dedicated craft tent where Sam and Flo made paper crowns, played in the sand and had drawing competitions with some of the other children – and adults – who were there. The suits, which are for kids aged 2-4 years, are separates which zip together and are great cover-alls for messy play. 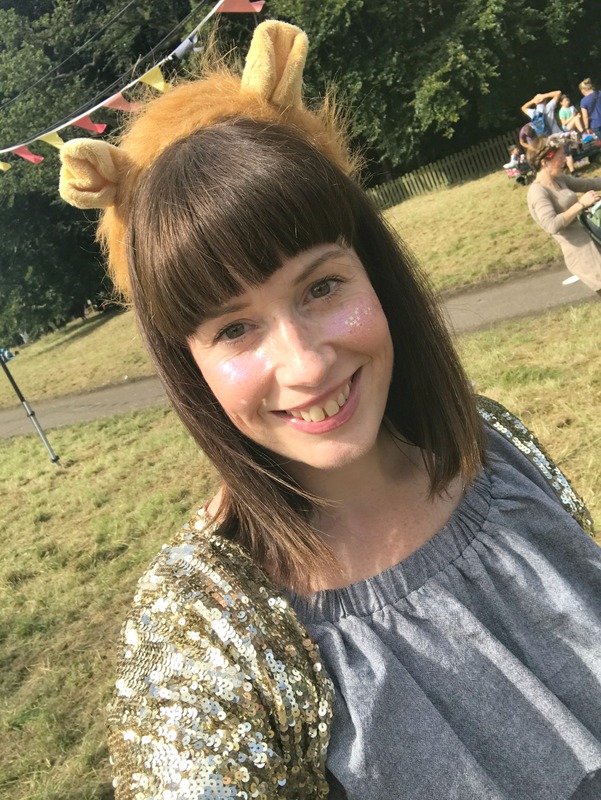 Flo loved running around in hers and it saved the sparkles on her lion costume getting covered in glue and mud from the off! Another of the things on our hit list was the Midnight Feast. Held from 11.30pm on the Saturday night, this was something Sam definitely wanted to do but the rest of our friends decided was a bit too late for their little ones. I have to say, when you’ve been awake since 7 and walking round the festival all day, staying up so late with kids is not that enticing a thing! I was in two minds whether we should go or not but in the end we went for it and I was so so glad we did. By the time 11.30 came I was starting to wonder why I’d stayed up, why wasn’t the midnight feast at 10? And was it was too late for a coffee? 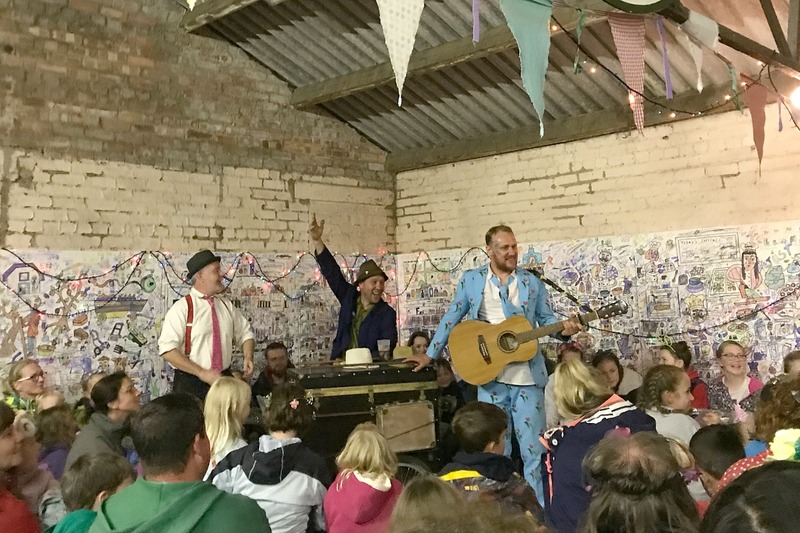 By 11.40 I was happy we’d stayed up, none of these things mattered and we were happily sitting on hay bales in a warm barn, helping ourselves to popcorn and biscuits and singing along with Gary (Gacko) Bridgens and Mr Foppletwig – aka Dieter Waidson. This was before we listened to some thought-provoking stories from Ian Douglas, who was celebrating his wedding at Just So! 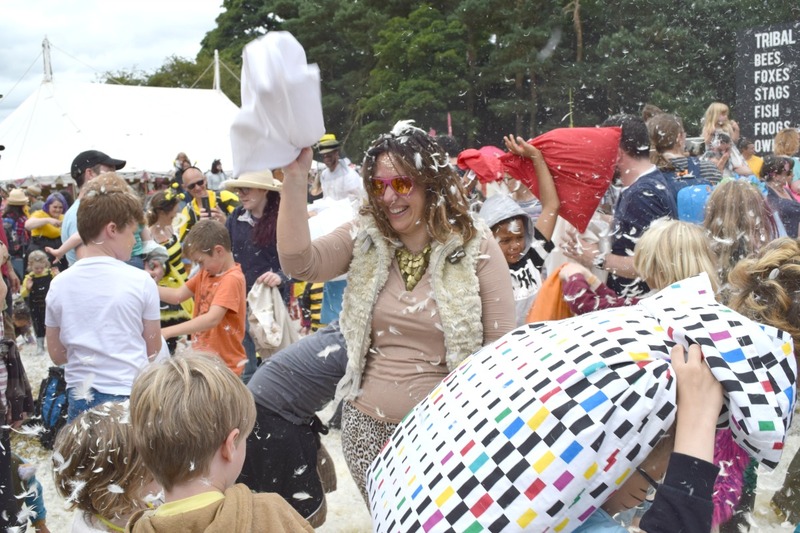 To write down everything we did at Just So would take forever but I have to mention another highlight – the Pillow Fight! We had come prepared for this with some feather pillows we picked up in our local bargain homewares shop, and having sneakily cut a few holes in them to produce maximum feather leakage we were ready to fight. Everyone gathered on the Village Green on the Sunday afternoon and got stuck in – the only rule was to not hit anyone younger than yourself, and to put your pillow on your head if you’d had enough and wanted out. 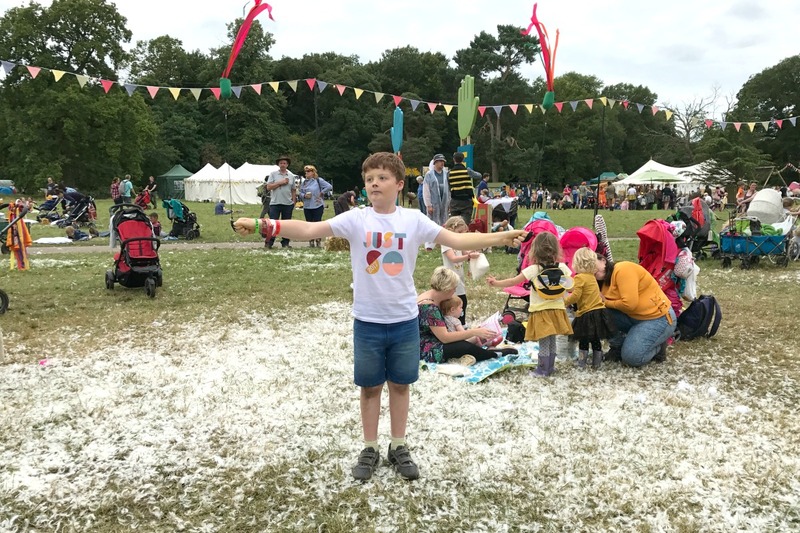 This kind of sums up what Just So is all about – doing things that kids really want to do that they probably wouldn’t do at home, on a grand and glorious scale. 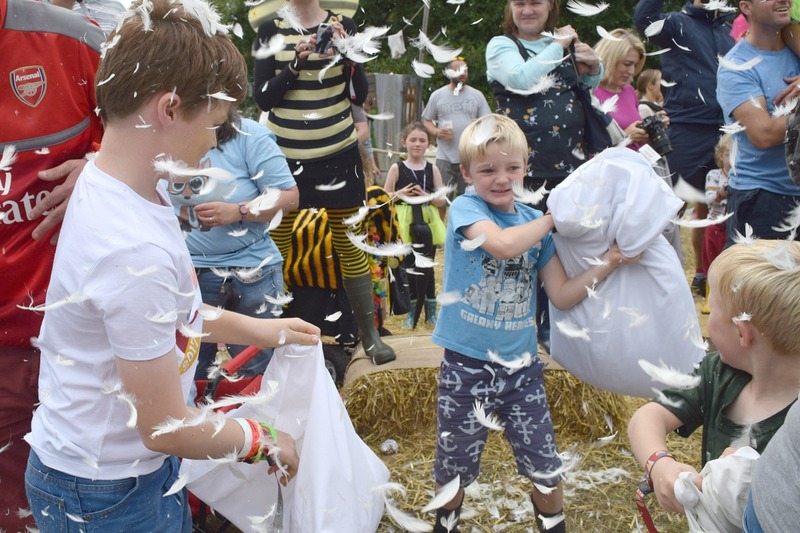 To see so many people laughing their heads off in a cloud of feathers was awesome and made for lots of giggling and photo opportunities, and not just from the kids! Also, it went on and on and never seemed to stop! We stepped aside way before the end as we were swallowing feathers, but Sam went back in and was stuffing his pillow back with fallen feathers to have another go. Just so magical. 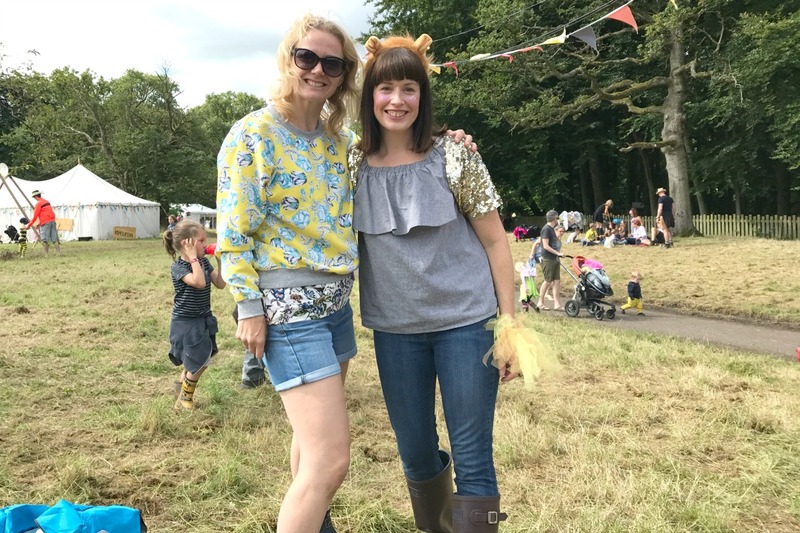 Over the weekend we saw loads of friends too, including some of my best blogging friends Karen and Rachel, and a first time meeting with the lovely Claire and her family from Tin Box Traveller. Having a bit of a crowd there meant we had chance to meet up for drinks and chill out a bit, hang out by the tent too and not be on the go all the time. Essential to keep adult and child energy levels up! I will definitely be going to Just So next year and we are already planning our costumes and picking our tribes. As for the camping? I’m hooked! This will definitely not be the last outing for our blue inflatable home. I was offered tickets to Just So in return for an honest review. All opinions are entirely my own. 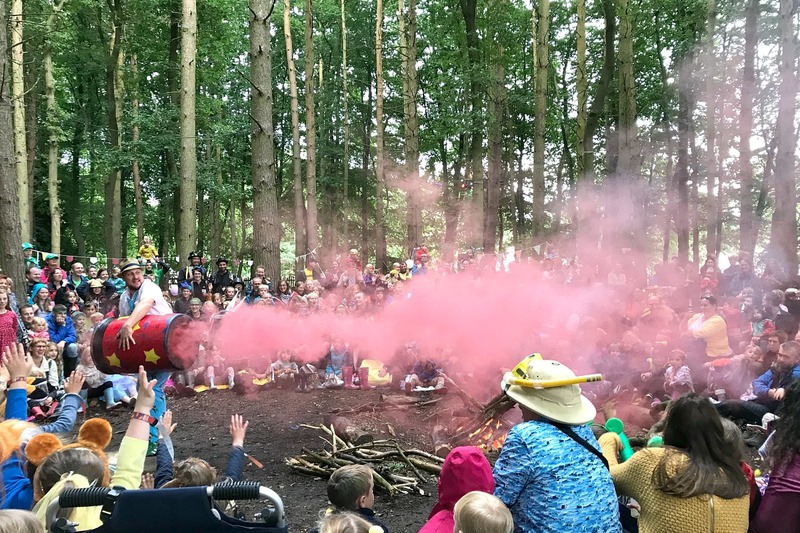 Early bird tickets for Just So Festival 2018 (17 – 19 August, Rode Hall Estate, Cheshire) are on sale now. Really captures the day Julia, lovely.